What is a Marketing Network? 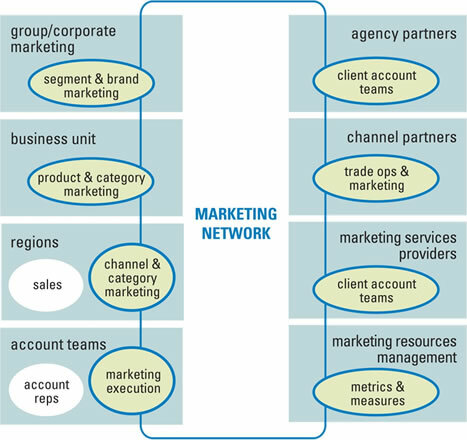 MarketFrames applies a unique point of view to the discipline of marketing: a network approach. This perspective informs the way we design and optimize marketing structures and processes. It also informs how we help clients leverage knowledge and information across the enterprise and with key partners. Applying proven network theory, we focus on the design and management of organization linkages (or seams) so that the critical connections with other business functions and external partners are clear. Marketing structures and processes are well-defined, marketing knowledge is optimized, and marketing assets are managed for advantage. The result? A winning Marketing Network delivers more effective and efficient development and delivery of messages and programs for your markets, and products and services for your customers.